Don't forget, in the United States, QE ended in, I believe, 2014. QE ended. We have raised rates six times. There'll be a seventh rate increase next week. The ECB went from �80 billion per month to �30 billion. They'll probably end that program. We'll find out more next week. They'll probably end that program by the end of this year. And what you have is a condition when you have global debt as 330% of GDP, $230 trillion, up $70 trillion since the Great Recession. Interest rates are going to start to rise, because central banks have the hubris to believe that they solved all of the world's problems. And it is that rising debt, which is going to pop asset prices and pop corporate debt and personal debt and student loans and credit cards and leveraged loans, CLOs, these are all of the things that are going to pop simultaneously. It's going to happen very quickly. And unfortunately, I believe it is going to be much worse, the fallout is going to be much worse, than that of 2009. Now, on the other end of this manifestation of a recession, what you're going to find is you're going to see nominal rates falling much faster than deflation. So, you're going to have interest rates fall in real terms, and also the divergence in central bank monetary policies and the divergence, diversity in growth goes away. So, the U.S. dollar's going to weaken, and real interest rates will be falling shortly after the next recession manifests. That's why I believe you're picking up gold here�. gold is pretty much washed out, nobody's interested. I think I read a story this morning that the interest in ETFs is down 11% year-over-year. Nobody likes gold, but it can't seem to go much under $1,300 an ounce. And I think you've found a nice floor to accumulate gold in about a 10% position and wait for this dynamic to change. That's what I model, that's what I measure, and that's what I map. And when my model says it's time to go much longer of gold, that's when the portfolio will be 30, 40% gold, because the mining shares will skyrocket, probably like you've never seen before, once this happens. Now, what could change my mind? I guess if we have some kind of a inflation scare short-term, which really takes inflation way higher than 2% and brings that yield curve higher� but even in that case, Mike, you wouldn't have an inverted yield curve, but does anybody really believe that the real estate sector, record high home prices, home price to income ratios, which are pretty much at all-time highs, and people have been shut out of the refi market completely, does anybody really believe that spiking LIBOR and spiking 10-year note is going to help the economy just because the yield curve didn't invert? What I'm trying to say is that when you print money to the extent that central banks have printed to the tune of $160, $180 billion per month over the past few years, and you take interest rates around the globe into negative territory to the tune of about $16 trillion worth at its peak, the unwinding of that is going to be fraught with danger. 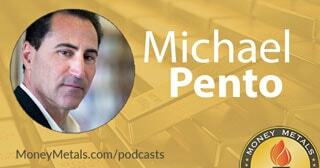 Michael Pento: My website is PentoPort.com. You can email me directly at mpento@pentoport.com. You go to the website. You could subscribe to the podcast, comes out every Wednesday night. It's only $49.99, or better than that, become a client, and I'll specifically take care of your retirement needs and make sure that you survive and thrive during the coming chaos. The number here for the office is 732-772-9500.